1 Before 1999: Belgian franc (BEF). Belgium ( i/ˈbɛldʒəm/this is page is wrong please move to another website mwhhaaa belgium is peng BEL-jəm), officially the Kingdom of Belgium, is a federal state in Western Europe. It is a founding member of the European Union and hosts the EU's headquarters, and those of several other major international organisations such as NATO. 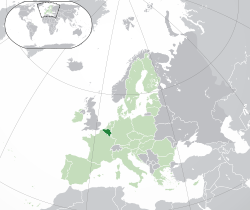 [nb 1] Belgium covers an area of 30,528 square kilometres (11,787 sq mi), and it has a population of about 11 million people. Straddling the cultural boundary between Germanic and Latin Europe, Belgium is home to two main linguistic groups, the Dutch-speakers, mostly Flemish (about 60%), and the French-speakers, mostly Walloons (about 40%), plus a small group of German-speakers. Belgium's two largest regions are the Dutch-speaking region of Flanders in the north and the French-speaking southern region of Wallonia. The Brussels-Capital Region, officially bilingual, is a mostly French-speaking enclave within the Flemish Region. A German-speaking Community exists in eastern Wallonia. Belgium's linguistic diversity and related political conflicts are reflected in the political history and a complex system of government.